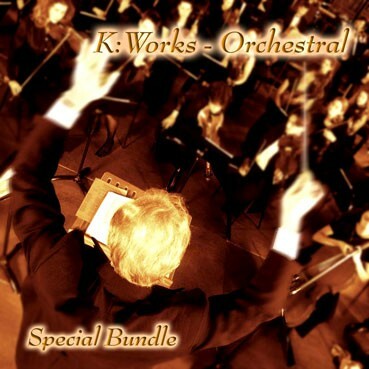 The K:Works - Orchestral - Special Bundle includes our K:Works - Orchestral Volume 1and K:Works - Orchestral Volume 2 sound program collections for an exclusive discounted price (Worth 99,90 € / Save 20,90 €). Comprehensive collection of classical instruments (acoustic pianos, guitars and basses, pipe organs, strings, wood winds, brass sections, etc.) and voices, including selection of program layer & split combinations. Excellent for symphonic music, film scoring and live performance. In addition to this, all Kurzweil K2xxx ROM and FARM "Orchestral" sound programs, newly sorted and well organized by Art of Sound to achieve easier access and use, have been added free of charge as a bonus.